In Bend of the River, Stewart plays Glyn McLyntock, a former Kansas raider now helping a family of good-hearted pioneers settle in Oregon. They know nothing of his past, but slick gunman Emerson Cole (Arthur Kennedy) who becomes attached to their party, does. Cole too seems to want to go straight, and helps defend the party as they make their perilous journey. The pioneers warn McLyntock that a bad man is always bad, and therefore Cole cannot be trusted, but McLyntock knows that he himself needs redemption just as much as Cole does. Ultimately, the pioneers are betrayed by unscrupulous villains, and Stewart, with his old violent nature returning, must try to settle the score. As foils, Kennedy and Stewart play off each other effectively, and Rock Hudson also does well as a (ahem) charming dandy from San Francisco (Rock liked to watch his own movies with gay friends and laugh at the subtext — they must have chuckled here when he tells a smitten young woman to go away because he wants to be with the men). The violence is extreme for the early 1950s, with dozens of people being wounded or killed on screen. What is unfortunately not out of place in the early 1950s are some mercifully brief but still off-putting scenes with Stepin Fechit as a stereotypical African-American character. But to close on a positive note, the scenery is gorgeous and everyone seems to know how to handle horses and guns, including during the climactic shootout. The Naked Spur features another psychologically damaged Stewart character who cannot accept that what is lost is lost forever, no matter how much vengeance you take. With able assistance from Mann and two other noir icons (Ralph Meeker of Kiss Me Deadly and Robert Ryan of The Set-Up), Stewart delivers a cowboy movie with psychic weight. The film’s emotional dynamic is the reverse of Bend of the River. Instead of a once bad man trying to be accepted by good people by showing how good he is now, Stewart plays a once good man telling good people that they should not accept him anymore. That’s what makes Stewart and Janet Leigh’s heartfelt closing scene a knockout. 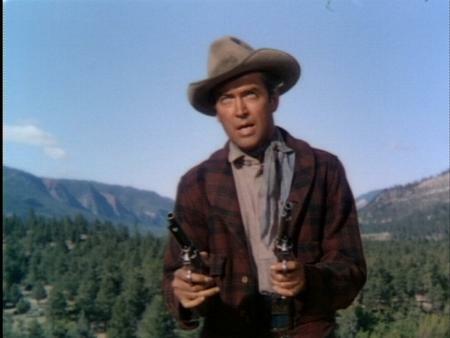 *Note, before I started regularly doing weekend film recommendations, a NYC film festival showing of Naked Spur led me to make some comments about Anthony Mann and Stewart that I have re-used in this post. YEAH! The Mann/Stewart westerns are awesome! …and I appreciate the symmetry, but let’s face it, Winchester ’73 is way better than Bend of the River…. You are the hero who directed RBCers awhile back to a Stewart rebroadcast on TCM, so everyone is in your debt. Yes, Bend of the River is not quite as good as Winchester ’73 but Naked Spur absolutely is. Oh, yeah, Naked Spur is the best of the bunch, IMNVHO.